Amazon's official Kindle app for iPad and iPhone has been updated to include integration with audio versions of titles when purchased through the service Audible, as well as cloud syncing with Whispersync for Voice. 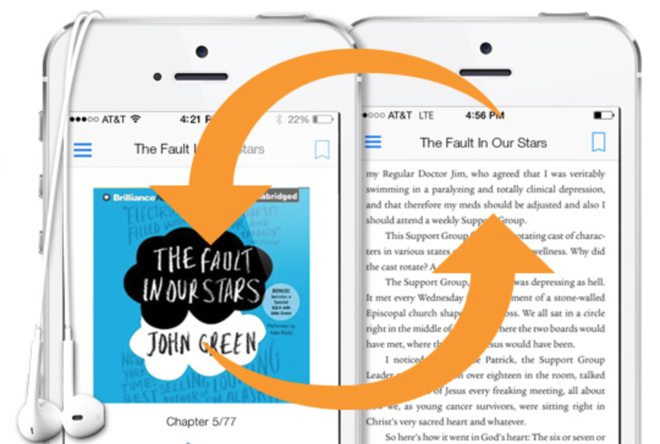 Kindle for iOS, as well as Google's Android, now allows users to switch between reading and listening without leaving the app, as long as they own both the Kindle and Audible versions of a title. The free update is now available. Of course, new e-book or Audible purchases cannot be accomplished through the Kindle for iOS app, as Amazon chooses to bypass Apple's in-app purchasing rules. Otherwise, Amazon would be forced to pay Apple a 30 percent cut of all Kindle sales. But for users who browse Amazon's website through a traditional Web browser, audio upgrades to Kindle books are available for as little as 99 cents, while upgrades to bestsellers start at $3.99. The updated app takes advantage of Amazon's "Whispersync for Voice," which allows users to have their audiobook pick up where they left off reading. "We're working hard to help customers find more moments each day to enjoy a great book," said Russ Grandinetti, Senior Vice President, Amazon Kindle. "Integrating professional narration into our Kindle apps means you never have to put down a favorite book--start reading at home, get in the car and simply tap a button to continue listening without losing your place." Professional narration is currently available for more than 45,000 Kindle books. Amazon also offers the Matchmaker service, which scans a user's Kindle library to find which titles have a companion Audible version available. "We continue to hear from a growing number of Whispersync for Voice converts who tell us the innovation has profoundly changed the way they read--in fact, switching back and forth between reading and listening has become their preferred way of experiencing stories," said Audible founder and CEO Donald Katz. "And the feature has gotten easier and easier to use, as this exciting integration into Kindle apps attests."